Coming off the franchise’s most successful season to date, Rinne and artist Dave Gunnarsson took a different direction when crafting the goaltender’s latest bucket. 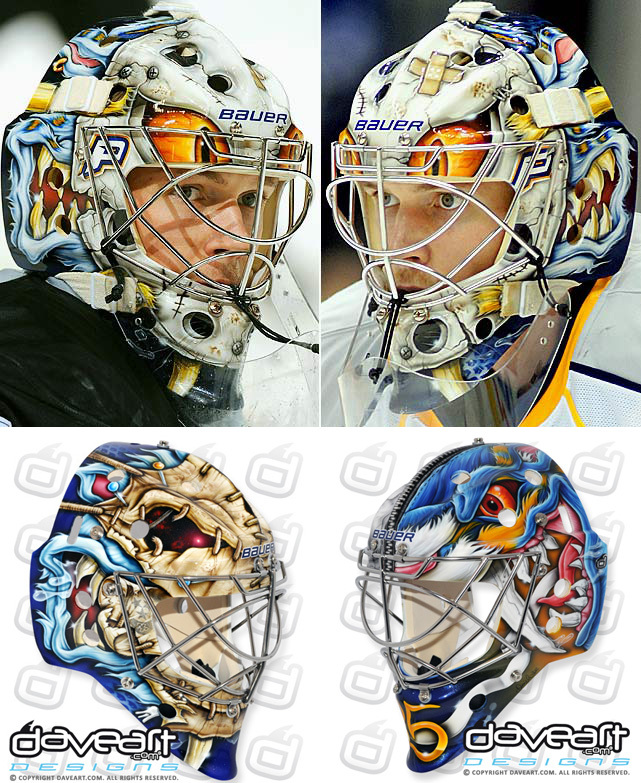 After a long string of monster and movie-inspired masks, this design is centered all around the Predators’ logos. 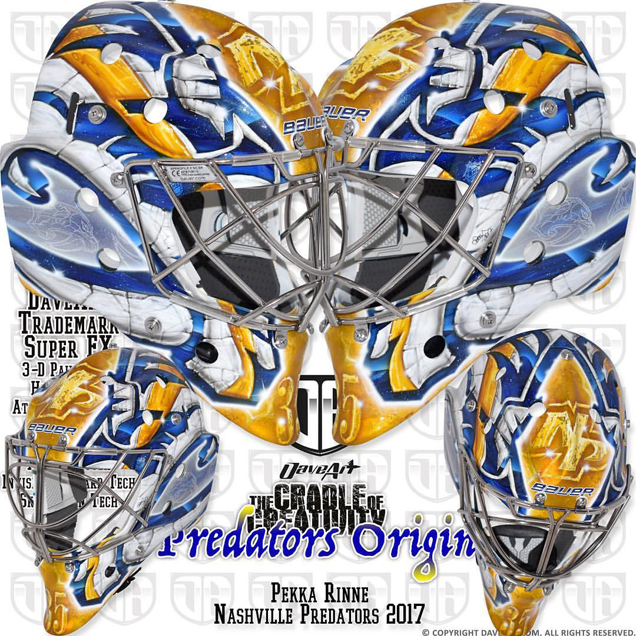 “We have worked together for more than a decade,” Gunnnarson shared of the tandem, confirming that “this new design is built on the foundation of the awesome logos of Nashville Predators.” Cropped renderings of the Preds’ primary logo sit on each side of the mask, jam packed with Gunnarsson’s signature textures and special effects, with the alternate “NP” centered on the top. 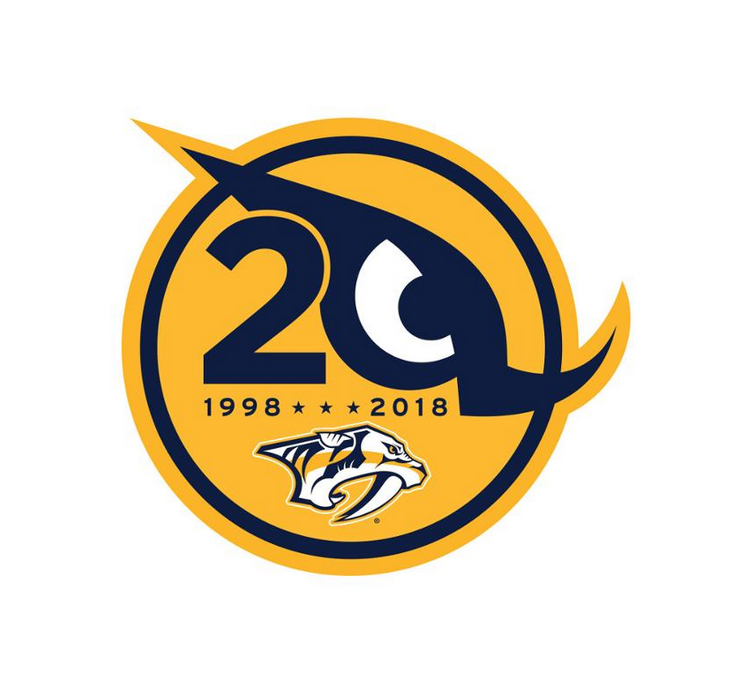 This mask is a vast improvement from Rinne’s past buckets, but the only thing keeping this from receiving a perfect score is the omission of the team’s 20th anniversary logo, which would’ve really given the design an extra something special. Overall though, nicely done by Rinne and Gunnarsson. Here we have it folks, the long-awaited and first ever Las Vegas Golden Knights mask. 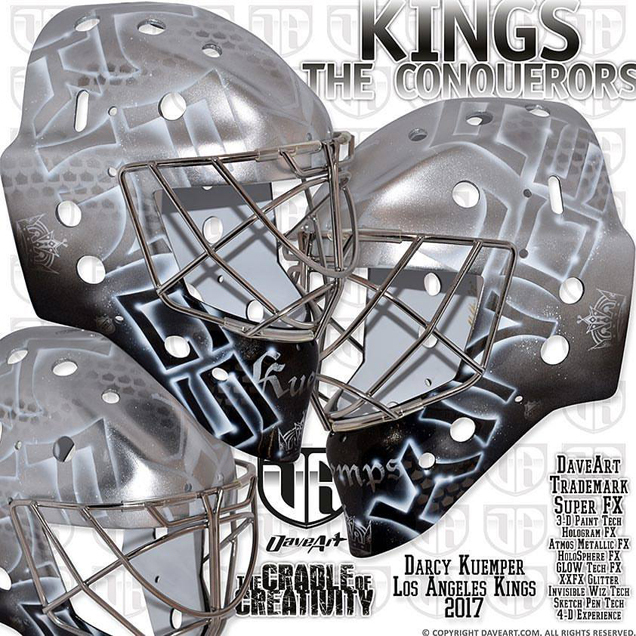 Unveiled by CCM Goalie last week along with new masks for Corey Crawford and Roberto Luongo, Flower’s G-Knights bucket crams just about everything you could imagine about the franchise into one design. Computationally divided into half Vegas and half knight-related elements, the right side features a gold-laden knight on a black horse wielding a golden sword and Vegas shield. The left side of the mask is centered around the city itself with landmarks like the “Welcome to the Fabulous Las Vegas, Nevada” sign, the Stratosphere tower and the New York New York hotel’s Statue of Liberty all behind another larger golden knight in the foreground. 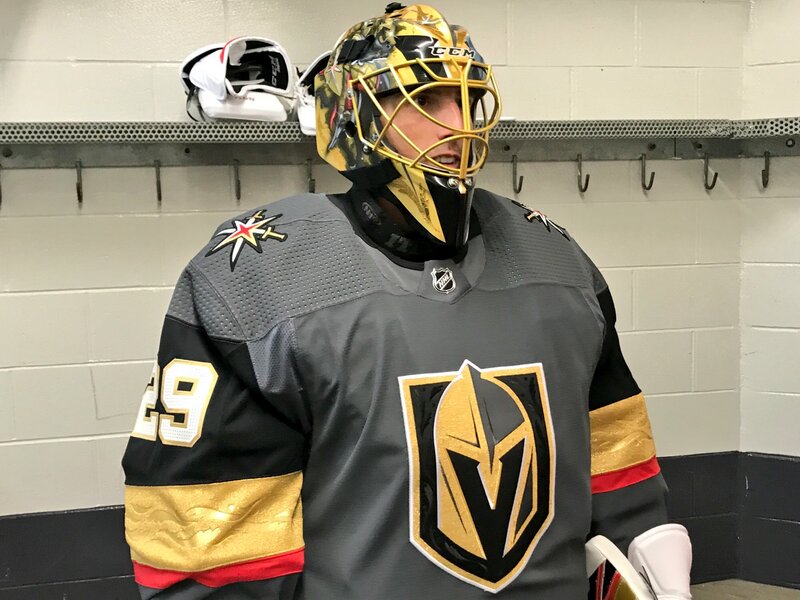 On the plus side, this design (likely painted by MAF’s regular artist, Stephane Bergeron) has a good amount of red which helps make sense of the odd red striping on the Knights’ jerseys. 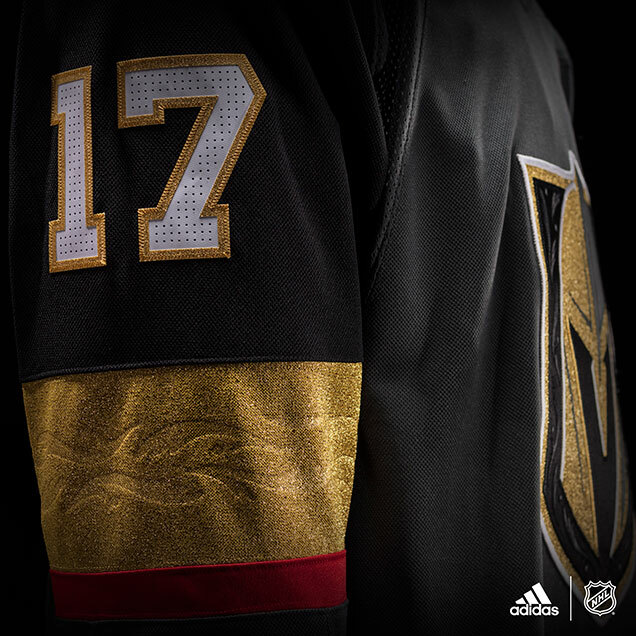 The downside here is that it’s just way too much gold (yes, even for Vegas). The whole right side of the mask gets lost due to the lack of contrast, and while the foil filigree is a nice touch (on mask, not on a jersey sleeve…), it’s almost impossible to see due to the abundance of gold paint surrounding it. Based on the high quality of Fleury’s prior masks, the expectations were high coming out of the gate, and unfortunately this one just falls short. 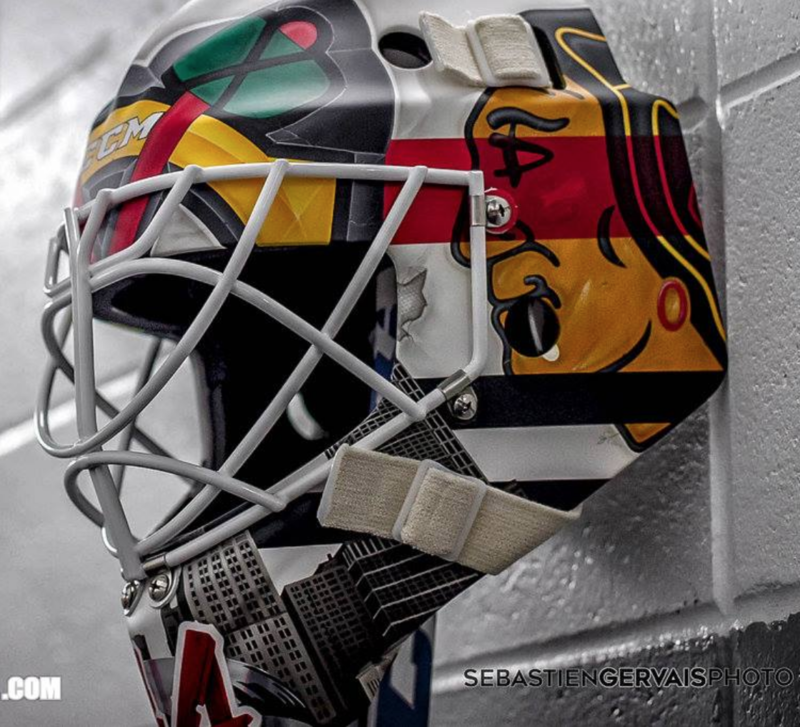 The third mask unveiled in the CCM photo shoot was Corey Crawford’s latest Blackhawks creation. 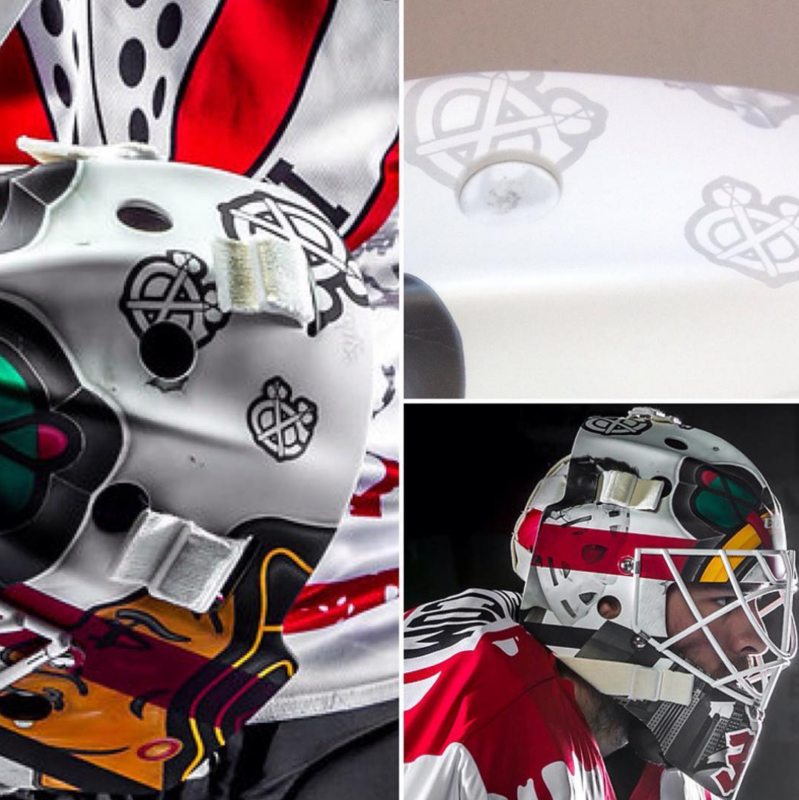 Crow’s masks are most often centered around the Blackhawks brand, and this year’s design is no different. With the team’s iconic logo placed prominently on the top, the sides of the black bucket are filled in with airbrushed tomahawk feathers and the team’s alternate “C” logo cropped along the bottom. The composition of this mask is really straightforward with not much to complain about. 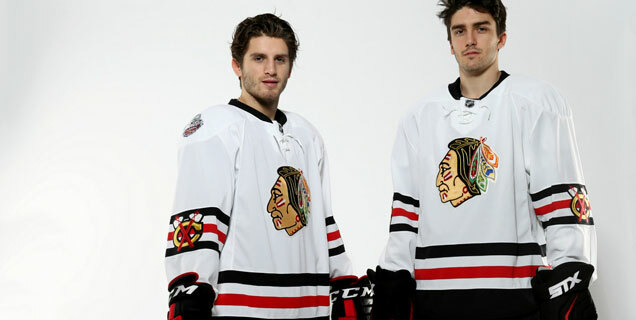 Like every Hawks outdoor game jersey as of late, does it blow me away? Not really, but there’s nothing to rip apart either, so have at it. 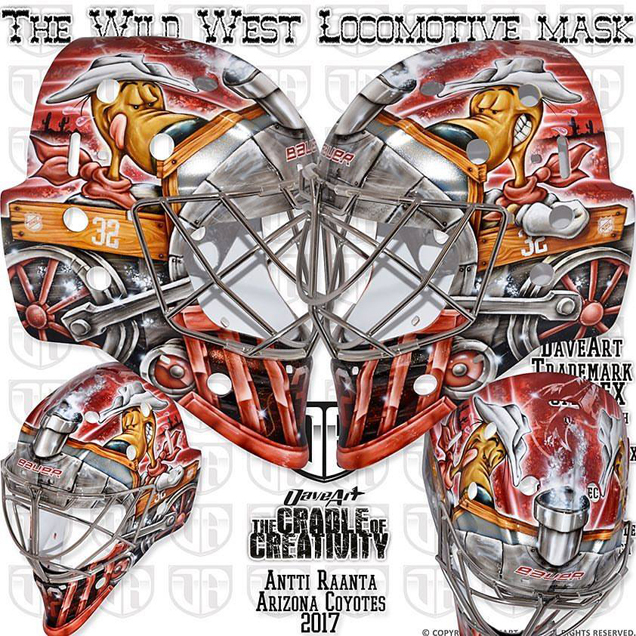 In his first season with the ‘Yotes, former Ranger Antti Raanta will be channeling the western desert, sporting this locomotive-themed bucket by Dave Gunnarsson. “Raanta’s alter ego is driving a real wild west locomotive on his new Arizona Coyotes bucket,” Gunnarsson shared of the hyper-detailed mask. The dog character that we’ve seen grace Raanta’s masks year after year is depicted as the conductor of a red and silver steam engine with cacti and desert wind silhouetted in the background. While there is certainly a lot going on in this design, the symmetry and simplicity of the concept really help ground the piece and allow us to see what’s what amidst all the detail. From a distance, this might be hard to read due to the lack of contrast between the gray and red tones, but bonus points for creativity in this fun and playful concept. 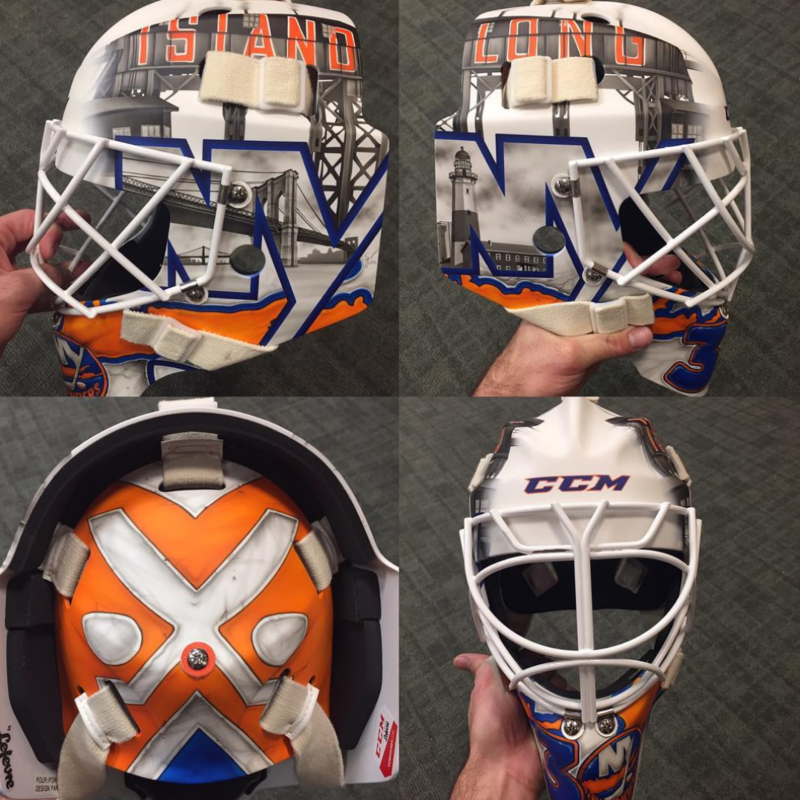 For his first season with the Jets, Steve Mason got a sharp new bucket from Philadelphia-based artist Franny Drummond. The past few seasons, Mason has garnered attention for his beautifully executed zombie masks, also painted by Drummond, but this year the artist and goaltender took a different direction, opting instead for a hyper-detailed and dynamic fighter jet scene. 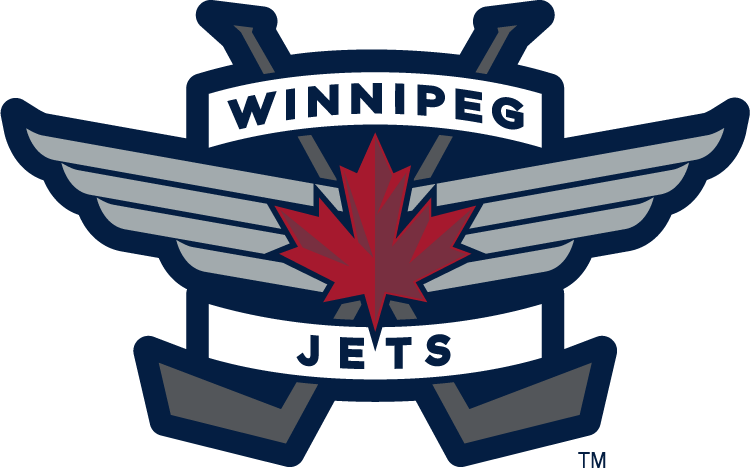 The Jets’ logo sits on the top of the mask as the centerpiece with a variation of the team’s alternate wings logo across the chin, including “Mase” over the maple leaf in the center. The negative space is filled with a well composed scene of fighter jets and explosions over the ocean, executed in a similar blue tone to the cloudy sky which creates a lovely, soft backdrop for the dynamic planes in the foreground. 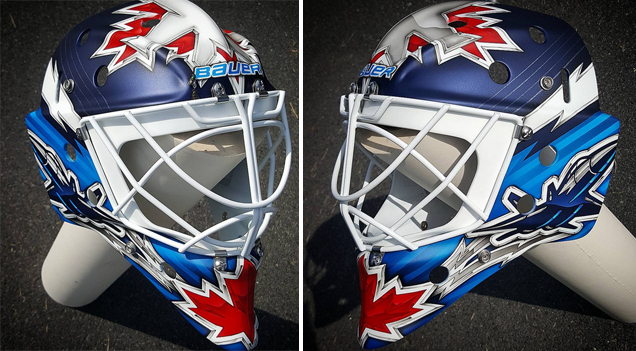 Overall, this mask is really well done and will look excellent with both the Jets’ home and road unis. 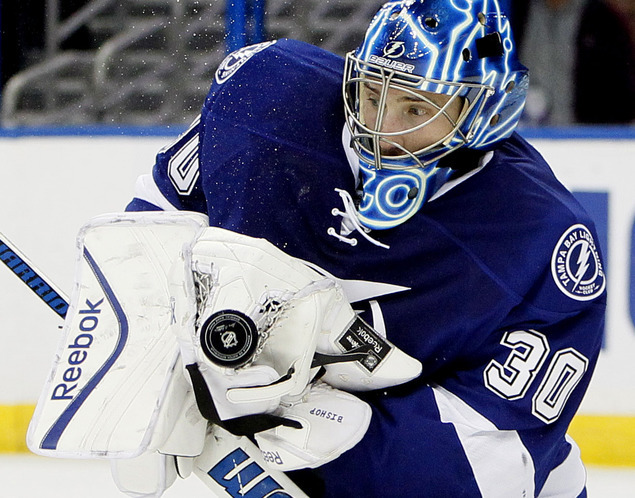 With one of the most iconic contemporary mask concepts during his time in Tampa Bay, Ben Bishop has yet to abandon the glowing look he and Dave Gunnarsson pioneered. For his first season with the Stars, the netminder and artist kept the same look and overall concept with a few updates for Bishop’s new team. “This glowing piece is a true Storyteller mask, and the closer you come the more details you will discover,” Gunnarsson described of the design. 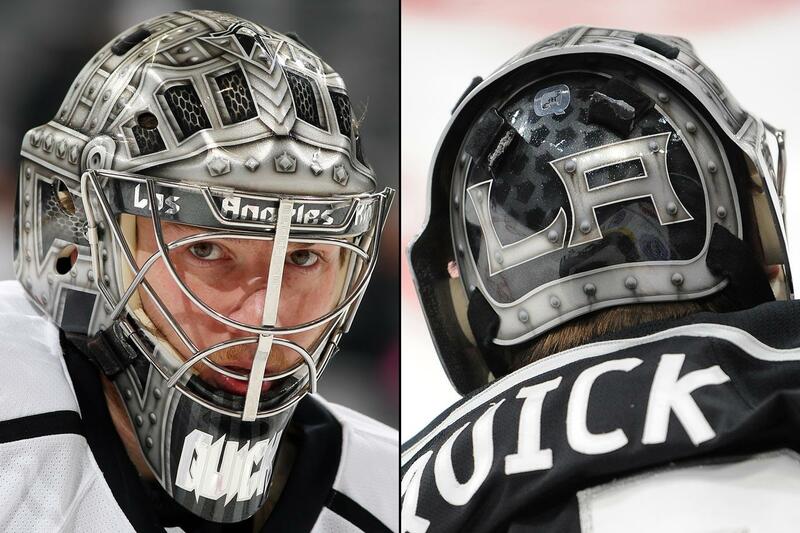 Like Bishop’s Lightning and Kings masks, at first glance you see the electric line work running throughout the mask. The glowing pattern spells “Stars” along the left side with a silhouette of the state of Texas, and the team’s logo is depicted on the right. Adding depth to the black negative space are tiny holographic Texas silhouettes, another signature element of Gunnarsson’s that’s been a mainstay throughout Bishop’s glowing mask history. While the initial concept connected perfectly with the Lightning identity, Gunnarsson has done a great job of translating the iconic look for Bish’s new teams and keeping it fresh from year to year. 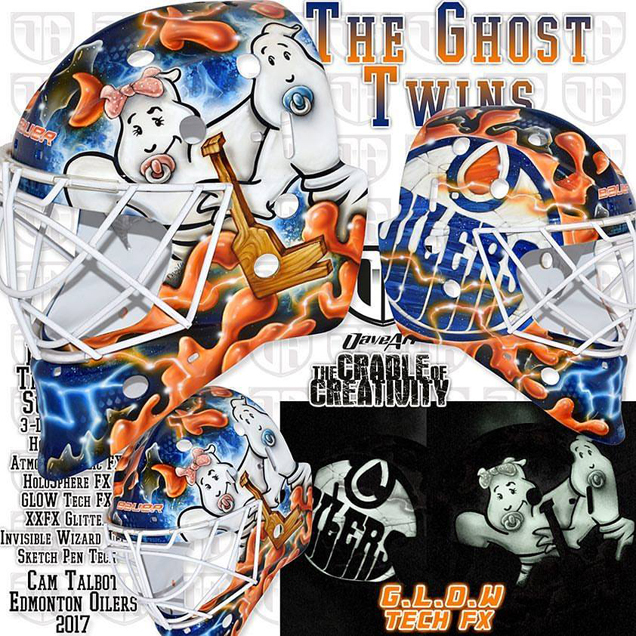 Not many goalie masks make you say “awww,” but Cam Talbot’s latest Ghostbusters bucket might do just that. “It is a tribute to Cam and his wife’s new family members, the Talbot Twins,” Dave Gunnarsson shared of the design. Talbot’s usual Ghostbusters motif has been adapted this season to represent the littlest Talbots with baby ghosts on the left side with a wooden goalie stick. On the right, the Oilers logo eclipses a splatter of orange slime and tiny holographic oil drops in the background. The Ghostbusters concept has been a mainstay for Talbot over the past few years, so while this mask isn’t wildly innovative or surprising, the personal touch makes it more special, and overall, it’s another solid and dynamic design. Titled “Avalanche Battlefront,” the bucket features a grayscale realistic lion head on the top framed by sweeping arctic waves on each side in the style of the Avalanche logo. 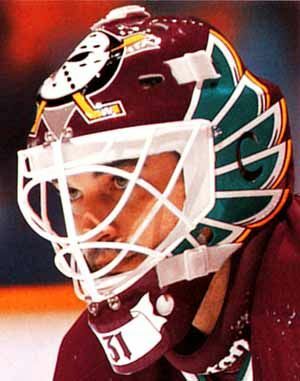 The white lacquer cage is set over a stripe of burgandy covered by an icy splash along the bottom and Bernier’s number 45. While the more graphic elements on the sides pop against the soft desaturated shading in the lion, the burgandy eyes help give the lion some depth and tie the color palette together. 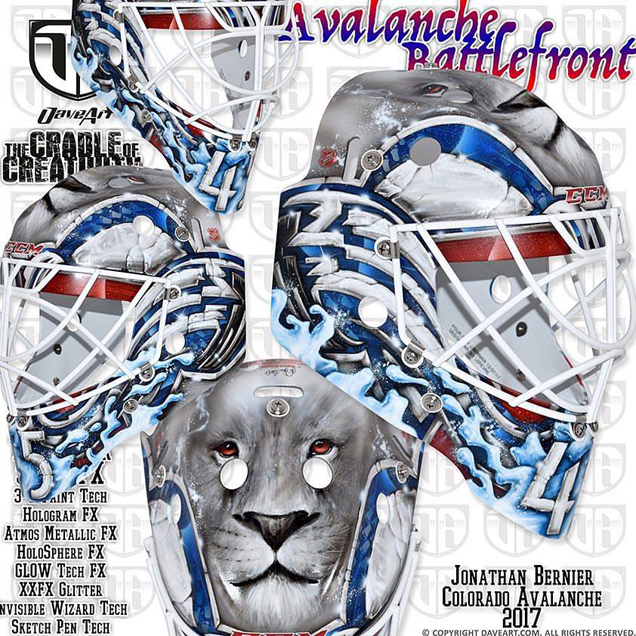 This design is pretty consistant with what we’ve seen from Bernier in past years, so I can’t say it blew me away, but it’s a decent composition that stays true to the netminder’s signature look. Michael Hutchinson and artist David Leroux have a long history of working together and producing stunning masks. Since the netminder’s time in Winnipeg, Leroux has consistently crafted him sleek and sharp mask designs, and this season is no exception. 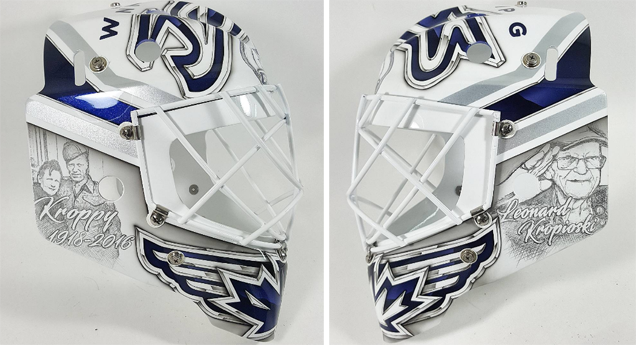 Reminiscent of Curtis McElhinney’s Leafs mask that Leroux painted for the 2016-17 season, Hutch’s latest bucket uses a paired down color palette of just white with navy accents, making for a really graphic, high-contrast look. This year’s design is a memorial piece for long-time Jets fan and veteran Leonard “Kroppy” Kropioski who passed away in September of 2016. Sketch pen portraits of Kroppy grace each side of the mask with crisp chromed-out and sketch pen logos in blue on the top and chin. 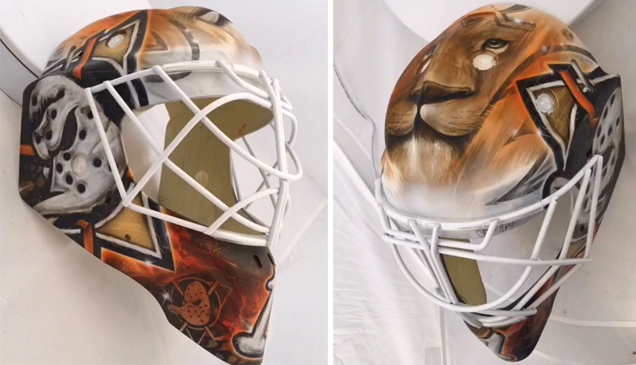 In addition to the touching sentiment of Hutch honoring a heroic fan with his mask design, this bucket is beautifully executed in Leroux’s signature style. Another job well done by this duo! In his first season with the Blackhawks fighting for a role as Corey Crawford’s backstop, JF Berube has a fantastic new mask honoring Chicago goaltending great, Tony Esposito. Painted by Sylvie Marsolais of Sylabrush Airbrush, the mask has a collaged and almost photoshopped feel that we haven’t seen much of before. The netminder and artist duo have a history of creating great masks together, as seen with JF’s Islanders bucket from last season, and this new design is no exception. 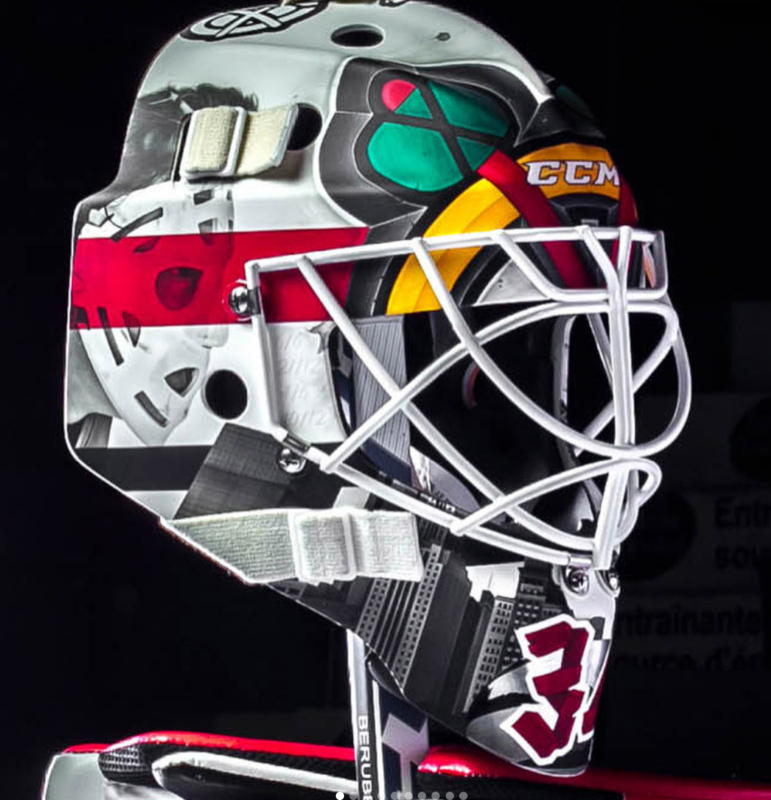 The left side of the mask has the Blackhawks’ primary logo opposite a beautifully executed portrait of Espo on the right, both covered by a thick red stripe that multiplies through the imagery like vellum. Black and white buildings from the Chicago skyline wrap around the chin of the mask with the Hawks’ secondary logo large on the top center. “One of the coolest stuff on Berube’s mask,” as the artist described on Instagram, is “he[‘s] got some special SubZero Paint on it! 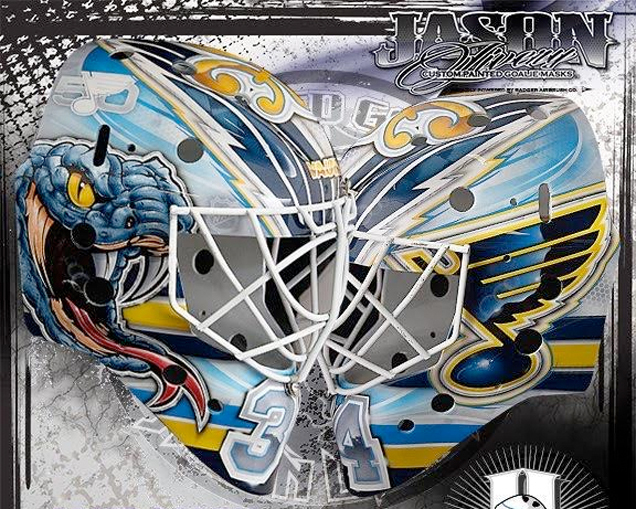 When JF hits the ice, the logos on top of his mask become black.” We’ve seen Sylvie use this technology on other masks before including Anton Khudobin and Andrei Vasilevskiy’s, but it really works to the design’s advantage here and is smartly applied by the artist. Overall, this is a really great design and a wonderful tribute to a Chicago legend from top to bottom. High marks on another great mask! The inspiration here isn’t bad. Honor Smith’s family? Awesome. Celebrate an iconic event in his new city? Great. But the composition and overall aesthetic value of this design are really challenged. 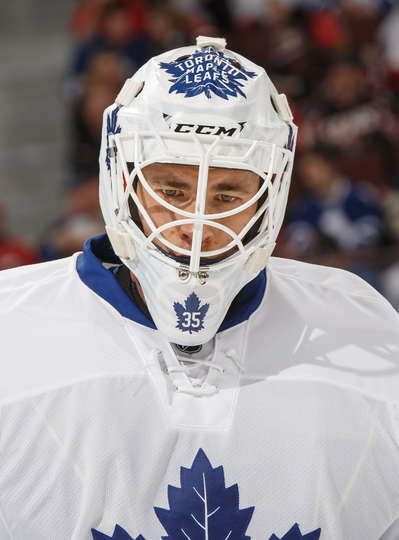 The mask has a very cut-and-paste feel but without the stylistic cohesion of say, Berube’s mask. The way in which the different elements are painted, from the horses to the barrels to the children, it’s all over the place. While I appreciate the thought that went into the concept for this mask, this design just really needed to get the axe. Jets netminder Connor Hellebucyk once again has a dynamic new bucket, and I for one am all about it. 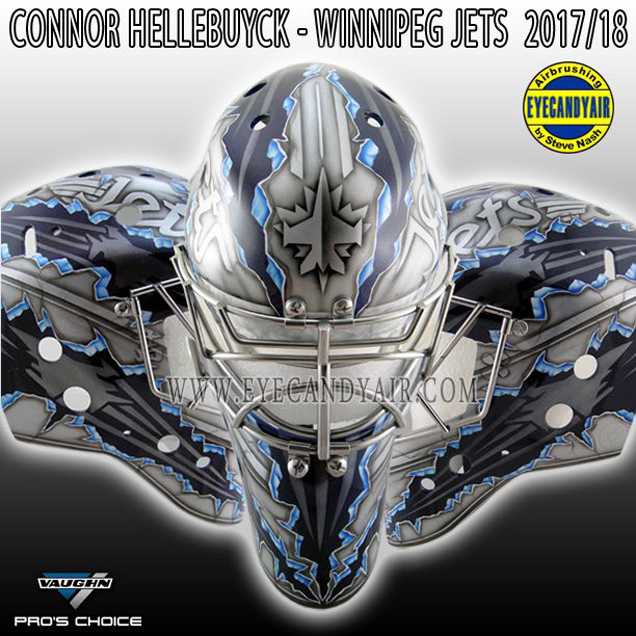 Painted by Steve Nash of Eyecandyair, The mask incorporates the Jets branding in a really different and well-composed way that gives Hellebuyck a unique and badass look. With aggressively illustrated metal tears creating the primary composition, the rips alternate navy and gray, giving a wonderful depth effect to the mask. The gray portions have pinstripes within each section in addition to Jets logos throughout, while the navy background includes subtle plane silhouettes, adding some visual interest to an otherwise very graphic look. 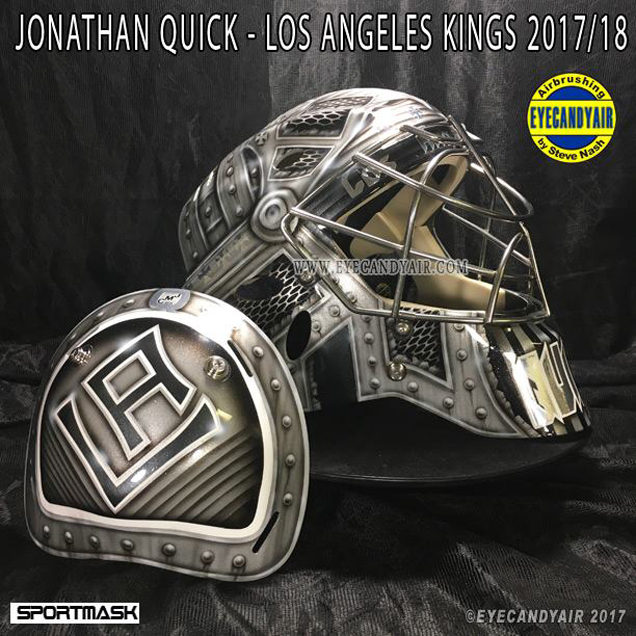 Nash has created some of our favoite masks, including Jonathan Quick’s battle armour and Martin Jones’ Sharks anniversary bucket, and this piece definitely didn’t disappoint. 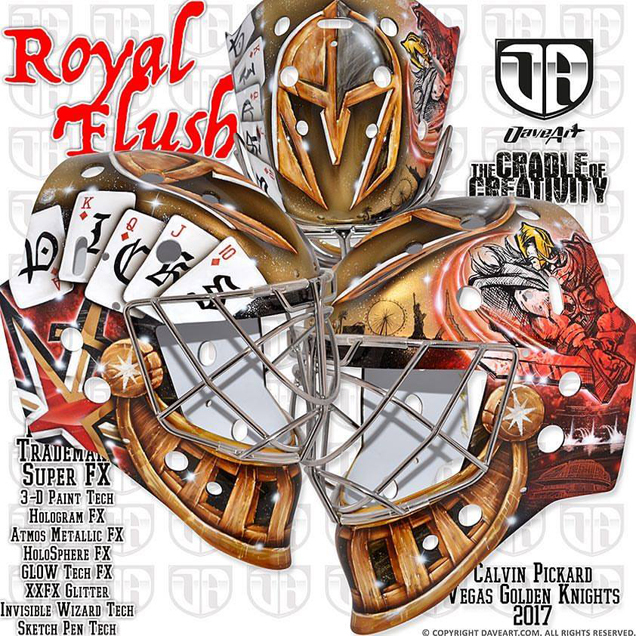 The second-ever mask out of sin city comes from Calvin Pickard and his fan-generated mask design contest. 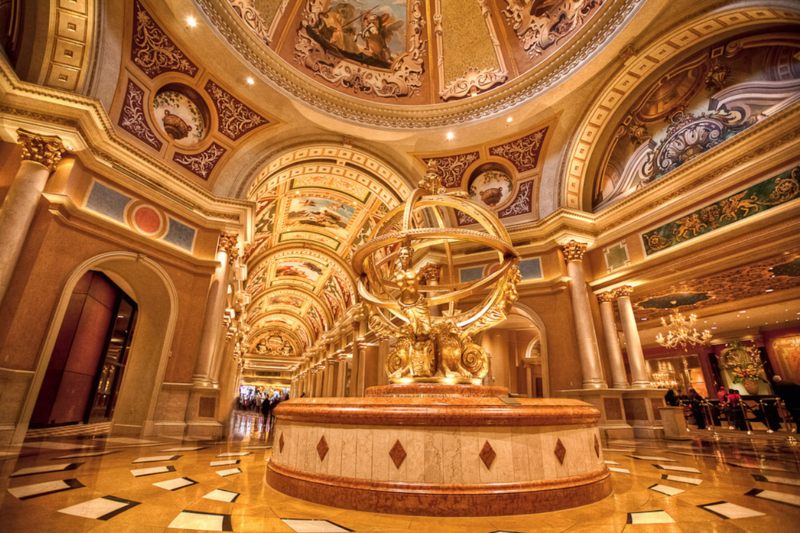 Ultimately painted by Dave Gunnarsson, Pick’s finished look is very gold and very Vegas. Titled “Royal Flush,” the winning design by Shawn Hickey shows a knight watching over the city with lots and lots of gold. 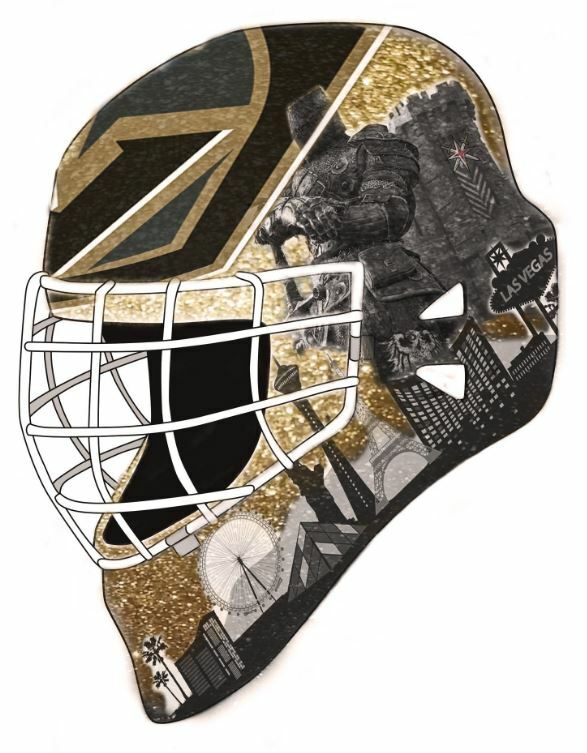 Gunnarsson’s interpretation shows just that on the left side while adding elements from the other finalists including a knight helmet piece around the chin and the Golden Knights logo predominantly on the top. The right side has the Knights’ alternate star logo with “PICKS” spelled out in a hand of playing cards. 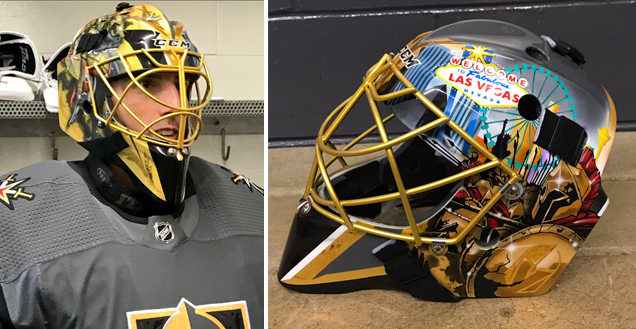 This mask is glitzy, gaudy and flashy and everything you’d expect from a Vegas franchise, but unfortunately by combining the concepts of five different artists, the end result looks like just that. 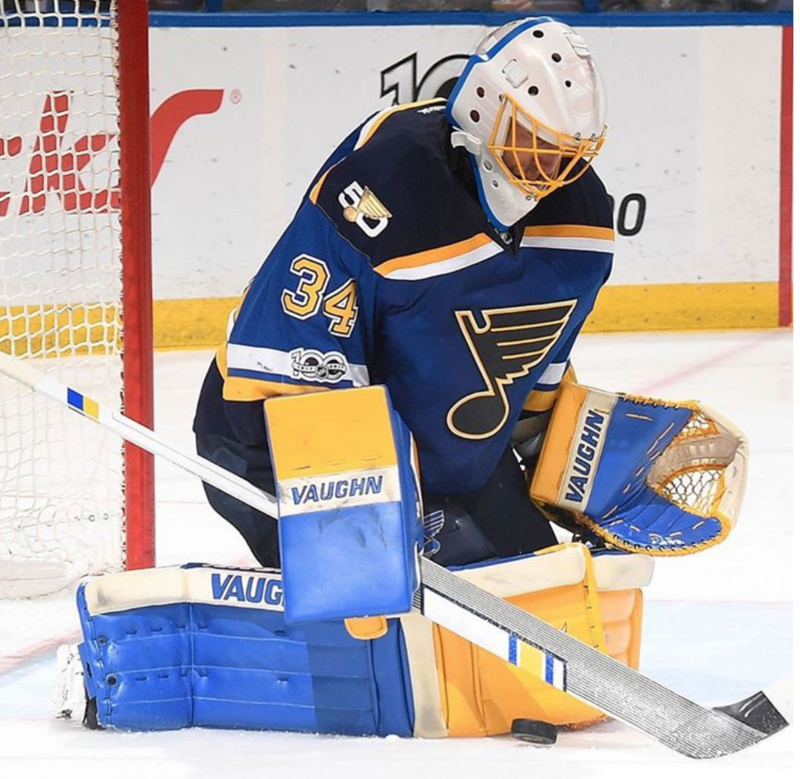 Jake Allen’s gear over the past few seasons has generated a lot of chatter for its graphic style, bold colors and retro flair. 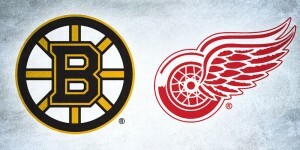 “Fans seemed to like the old-school look at the Winter Classic, so I kept that gear for the second half of last season,” Allen told NHL.com. 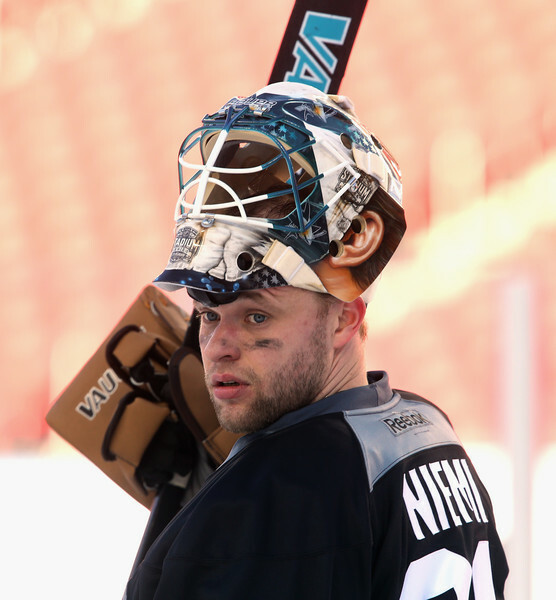 “This year’s gear is just an extension of that.” The netminder’s style has come a long way since his “Jake the Snake” days, and this new mask is a great continuation of his newly discovered old-school look. 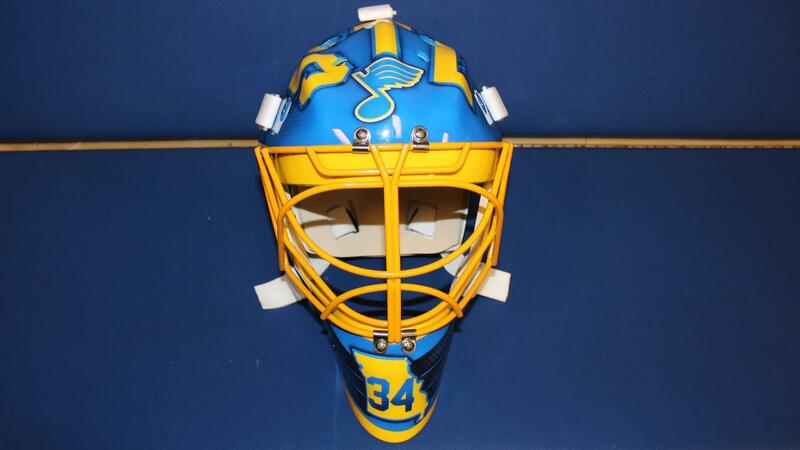 Painted by Jason Livery of Head Strong Grafx, the bucket is a tribute to legendary St. Louis musician Louis Armstrong, whose lyrics “I got those Saint Louis Blues” are painted in stripes across each side of the mask. Portraits of Armstrong sit above the stripes, framing a large “STL” and Blues note in the center. 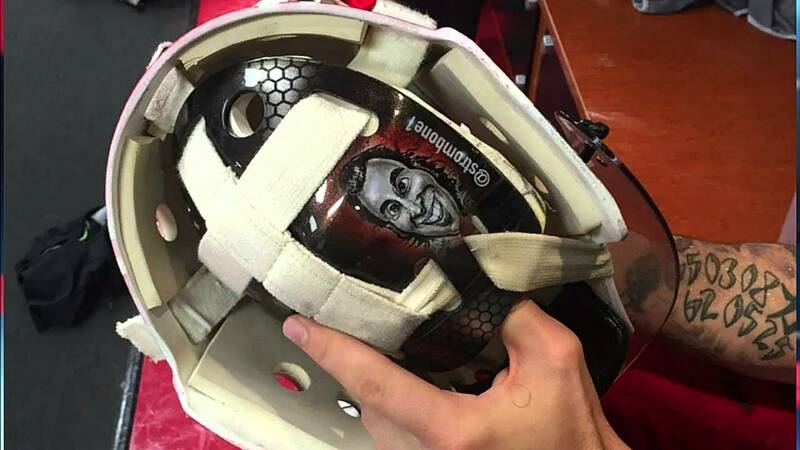 With one of the biggest personalities among NHL goaltenders, Flames netminder Eddie Lack never fails to inject some humor into his masks (just ask his former teammate, Roberto Luongo). For the 2017-18 season, Dave Gunnarsson created a design that fuses the Flames with Lack’s home country of Sweden, of course with a playful touch. “It was so fun to paint this,” Gunnarsson shared. “On the mask you will find flames made in a new way… they are made of rocks and stones.” The flame-shaped rock formations take up the majority of the real estate on this bucket with Swedish Tre Kronor stamped throughout the background. 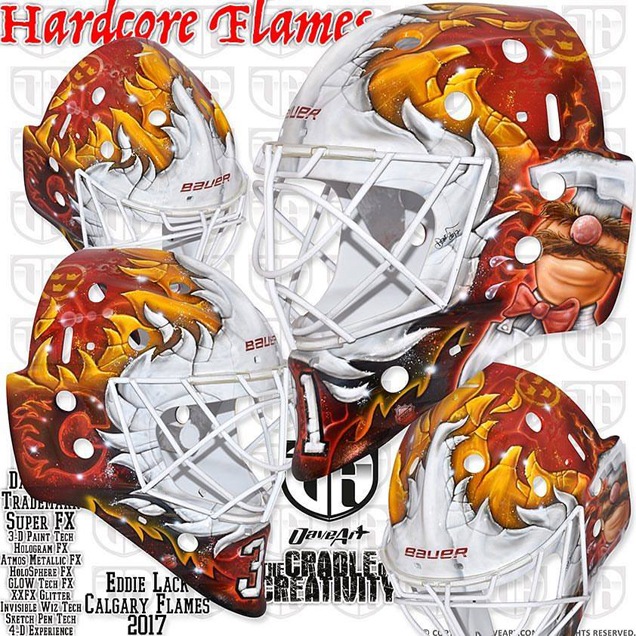 A glowing Flames logo sits on the right side of the mask with a familiar friend opposite on the left. “[It] again shows Eddie’s buddy up on the mask, ready to serve some tacos,” Gunnarsson explained, fitting since we all know how much Lack likes tacos. This mask gets some bonus points for its playful concept, but from a design standpoint. It’s pretty average. The stone flames don’t make a ton of sense, and while the personal touches for Lack are nice, the overall look unfortunately doesn’t stand out as fresh or unique. 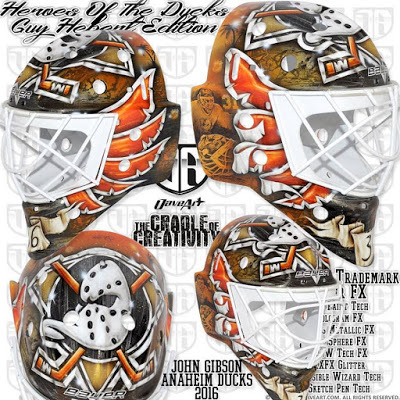 The composition is almost identical to Gibson’s 2016-17 mask with the Ducks’ mighty logo on top and layered hockey sticks forming wings on each side. 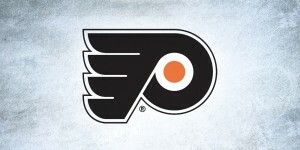 The orange base has been replaced with a jet black background, the only color in the mask coming in the orange sticks on each side. Despite the fuzzy texture, this bucket definitely has a sinister look, something we haven’t seen in Anaheim since the Hiller days. 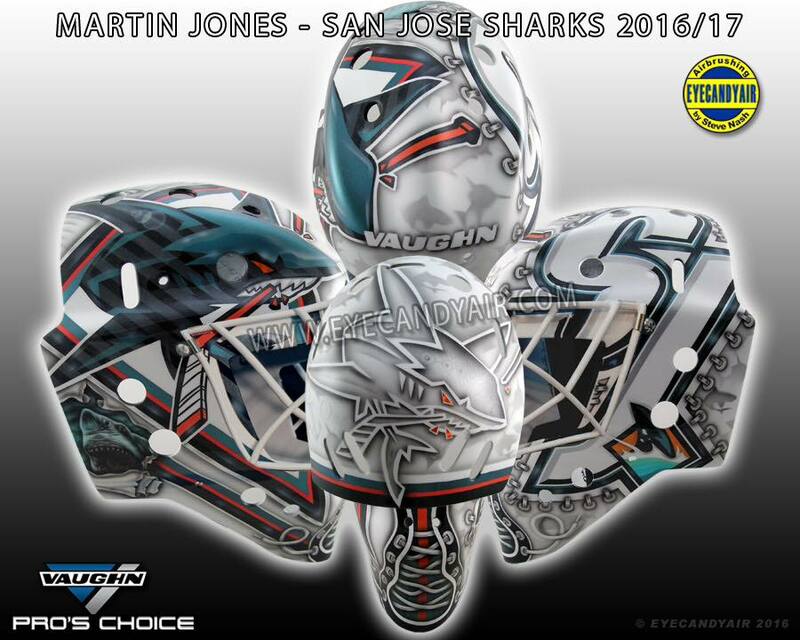 Since joining the Sharks by way of Los Angeles (and Boston for a day), Martin Jones has had nothing but fantastic mask after fantastic mask. 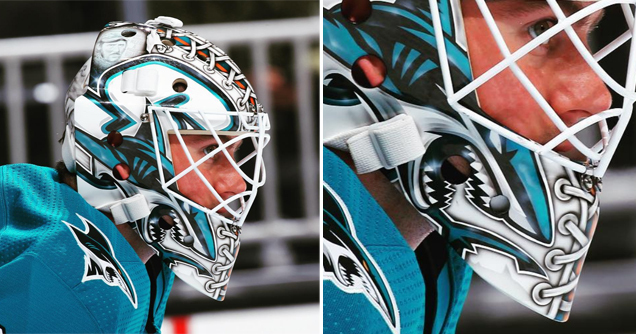 While Eyecandyair has yet to release the 360 view and official photos of Jones’ new bucket, the Sharks gave us a sneak peek via Instagram of the sharp, logo-centric design. 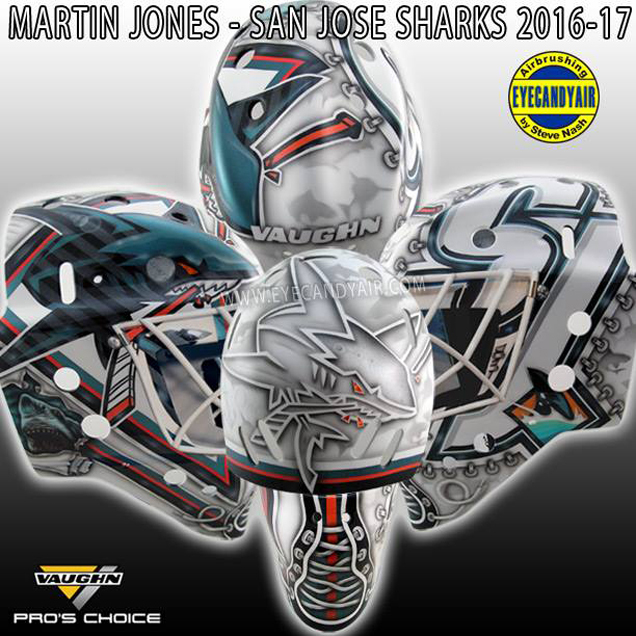 Like his 2016-17 mask, the Sharks’ logos and lacing take center stage in this design. 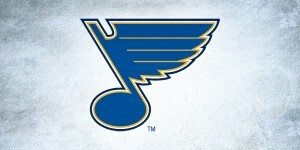 The team’s new alternate logo, also seen on the new jerseys’ shoulder patches, sits along the right side of the bucket over a large SJ monogram. Expanding on an element from past masks, this year the lacing appears to go from top to bottom, revealing a hint of teal and orange underneath. The visual hierarchy in this design and layering of elements works really well, creating a balanced composition that’s all about the team. Another job well done by Nash and Jones! 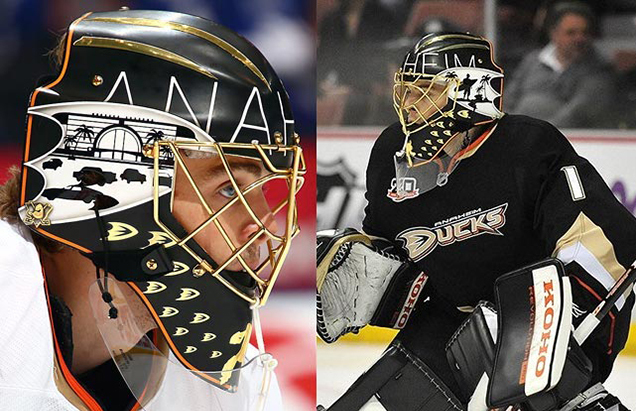 New Duck Ryan Miller has a slick orange new bucket from his long-time artist, Ray Bishop. 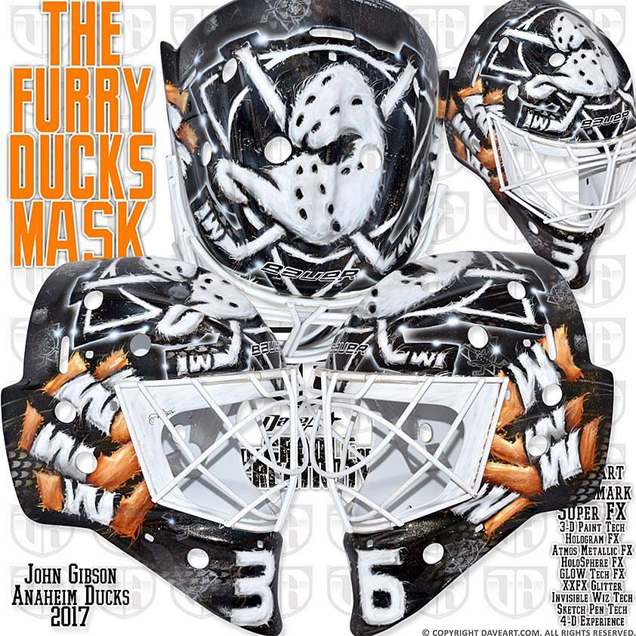 Based off of the team’s iconic logo, the design transforms Miller into the Ducks mascot while also paying tribute to his family on the beautifully painted backplate. 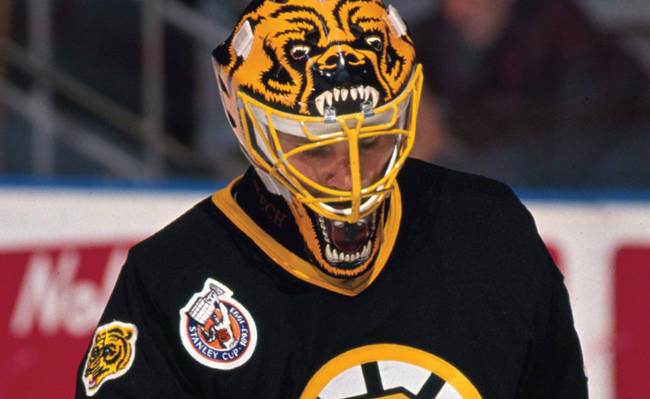 We’ve seen transformational masks throughout history, from Hayward’s iconic Sharks mask to Moog’s gnarly bear, and Bishop moves the concept into contemporary times. 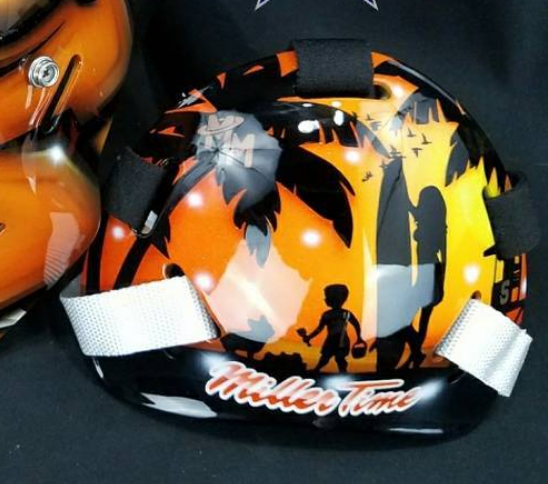 Above the netminder’s signature “Miller Time” slogan on the backplate, Bishop painted a lovely beach scene with silhouettes of Miller’s wife, son and dog. The colors in the sunset tie in perfectly with the orange hues of the rest of the mask, creating a cohesive yet meaningful design. Perhaps the most un-Daveart Daveart mask we’ve ever seen, Anders Lindbäck’s graphic and monochromatic bucket is as minimal as it is slick. 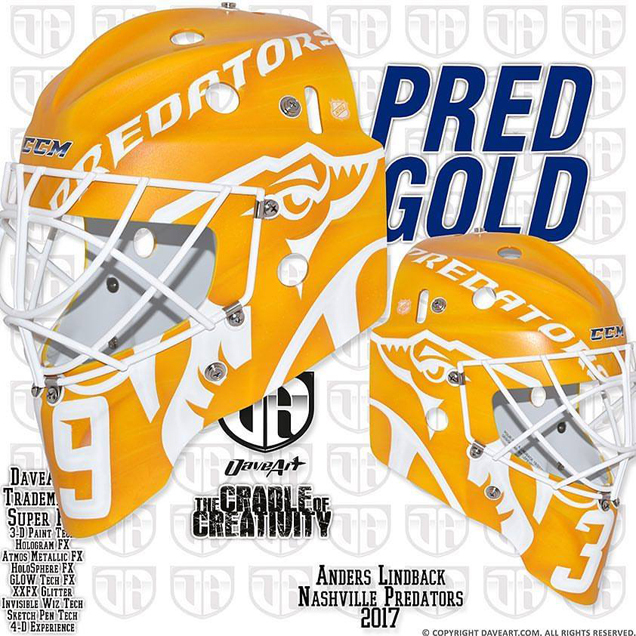 Titled “Pred Gold,” the mask is literally just that; all Predators’ gold with stark, white graphics. Seeing a Daveart mask this minimal is actually quite shocking, but equally as refreshing. With all of the hyper-detailed masks in the league, bold and crisp designs like this really stand out and look great on the ice. Nice work, Dave! 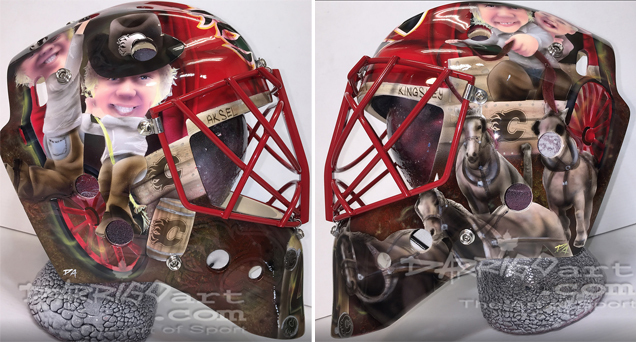 And speaking of hyper-detailed masks… we’re back to classic Daveart with Varly’s new Avalanche bucket. Reminiscent of the Rockies, this mask was self-described by Gunnarsson as “loaded with tons of 3-D FX,” and I certainly wouldn’t disagree. While it’s not the wildest Daveart creation we’ve seen, there’s a lot going on here. 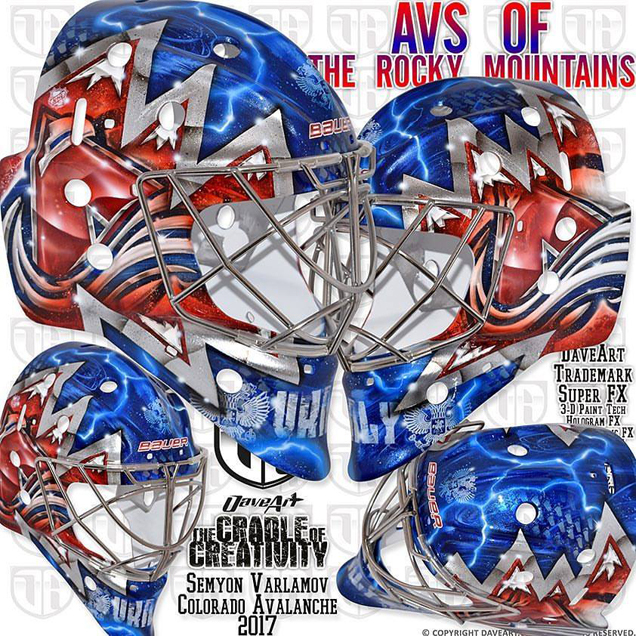 Each side of the mask makes use of the Avs primary logo, integrating it into a simplified rendering of the Rocky mountain range. Behind the landscape is an electric blue background including holographic logos, electric current and Russian iconography, a nod to Varly’s home country. From a distance, this composition is nicely arranged and different from what we’ve seen Colorado goalies sport in the past, but the amount of special effects shoved in around it unfortunately detract from the design overall. On top of the silver to black ombre, Gunnarsson used layers upon layers of logos to give a holographic look to this whole mask. The largest pieces here are the Kings wordmarks on each side painted over a field of mini crown logos throughout. Larger crown logos are dispersed throughout the mask in a scattered while somewhat haphazard manner. “The logos are created layer on layer which creates a very unique look when the mask turns from side to side and the silver FX sparkles like a diamond… Just like a king’s crown,” Gunnarsson shared, but despite the success of the ombre and concept behind this design, the logo placement creates a sloppy finished product that unfortuanately falls short. 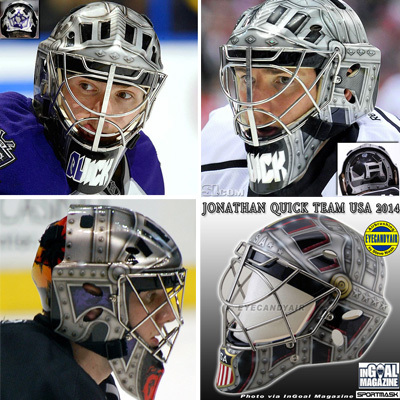 Kuemper’s teammate Jonathan Quick is perhaps the ultimate “if it ain’t broke…” goalie, keeping with the same battle armour mask concept for, well, as long as we can remember. The latest iteration by artist Steve Nash is very much in line with Quick’s recent buckets, using an all-silver color palette and metal textures to create a knight’s armour look. 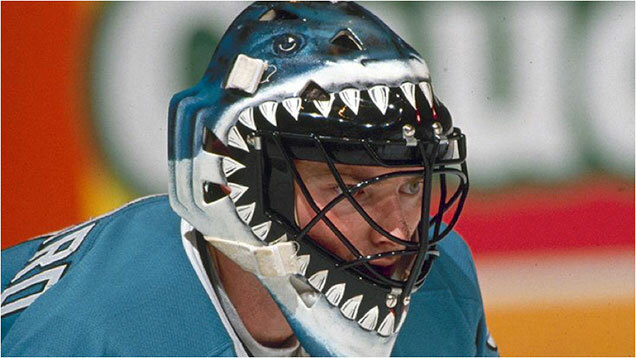 Throwback masks are hardly few and far between these days, including retro styles to tribue masks, and then there’s what I like to call the “ear masks.” We started seeing these looks pop up around the beginnings of the Stadium Series games when Niemi sported one for the Sharks, and the somewhat humorous / somewhat creepy concepts have stuck around ever since. 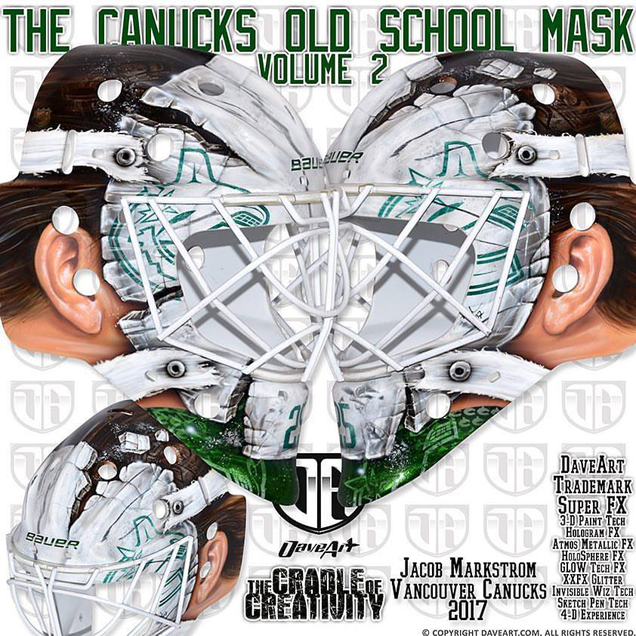 Following in this trend, Markstrom and Dave Gunnarsson opted to take this route, creating an illusionary white faceplate mask with green orcas strapped to a hyper-realistic head. This bucket gets some points for humor, but from a design standpoint, it sits a little bit stale.